Jeff and Kelly Ford set out in 2007 to open a restaurant that brought the quality of food, service, and spirits you would normally only find in larger cities. They never wanted to have a place where you felt you had to dress up. The casual upscale atmosphere sets the mood for a juicy New York Strip or a uniquely designed fish special paired with a great bottle of wine. They continually work to bring creative offerings that reflect current trends in the industry straight to Terre Haute. The Ford's believe that having good locally owned restaurants is as important to a city as having good golf courses, a community theater, a symphony, museums, parks, etc. Jeff and Kelly hope you enjoy your one-of-a-kind experience as much as they love providing it. The team at J. Ford's Black Angus is excited to show you our new location at 7th and Walnut. Please park caddy corner from us at 8th and Walnut. J. Ford's Black Angus is a local quality-driven chef-owned restaurant. We have a non-compromising approach to food and will never sacrifice in favor of profits. Creating an amazing experience for each guest that comes in our door is the goal of every employee in the building. We are constantly trying to improve what we do every day by bringing something unique or trendy to our customers, making us unlike any other restaurant in Terre Haute, Indiana. We wouldn't serve a customer anything we wouldn't be proud to serve our mother. Jeff was encouraged at a very young age to try new things. Through his father’s work and his mother’s love for good food, he was fortunate to be exposed to some very good restaurants and world class cuisine. Jeff’s first experience with cooking was at the young age of 17 working for a catering company frying chicken in the back of a semi trailer. He has worked in the food service industry since. While pursuing a degree in business at Indiana State, Jeff worked as a Sous Chef at Larry Bird’s MVP Club, which at that time was notable for its quality of food. While here Jeff received a letter of praise from a writer for Gourmet Magazine and in it asked for one of his recipes to include in an upcoming issue. Jeff had always wanted to become a chef. After graduating from Indiana State University, he was on his way to Culinary School in Poughkeepsie New York when he became ill and was diagnosed with a very rare form of Leukemia. This put those plans on hold for about 2 years while he was in and out of hospitals battling the disease. For no apparent reason after finding out his first child was on her way, Jeff started to get better. Jeff moved his family to Louisville where he took a job as Sous Chef at Churchill Downs. He then got a job as Executive Chef at the Audubon Country Club in Louisville. One of the top Clubs in Kentucky. For 12 years Jeff had been the Certified Executive Chef/Director of Restaurant operations at the Country Club of Terre Haute. He has been a Certified Executive Chef and member of the American Culinary Federation since 1997. In 2006 he competed against 11 top Country Club Chefs in the Ohio Valley Club Managers Association and took the top award. Kelly has worked in the food service industry, been a coach and worked for many years on sales. She started out in high school working in fast food. In college she started working at what was then Richard’s Townhouse, then worked for Marriott Food Service in their Catering division. In between this and going to college she also coached swimming for Wabash Valley Swim Club. After Graduating she moved to a full time position as a supervisor where she opened Generations Restaurant at the Indiana State University Food Court. After that she move to Indianapolis and worked as a Corporate Server trainer for Mountain Jack’s restaurant chain helping to open new restaurants. She was also an assistant manager when not traveling. The corporate world called and she moved into various sales jobs ranging from Fax machines to her last job working for Clear Channel where she was for 14 years. She has enjoyed working and living in Indianapolis but has always loved the restaurant environment and had wanted to get back into it somehow. She works full time for J. Ford’s Black Angus running the front of the house operations. She recently completed the level I Sommelier Certification. Now living in Terre Haute, Jeff and Kelly opened J. Ford’s Black Angus on October 16th, 2007. Their children, Josh and Taelor, have been a part of the restaurant since the beginning and have learned many life lessons as both owners and employees. We are constantly evolving and improving what we do every day and will continue to do so for as long as we are having fun. 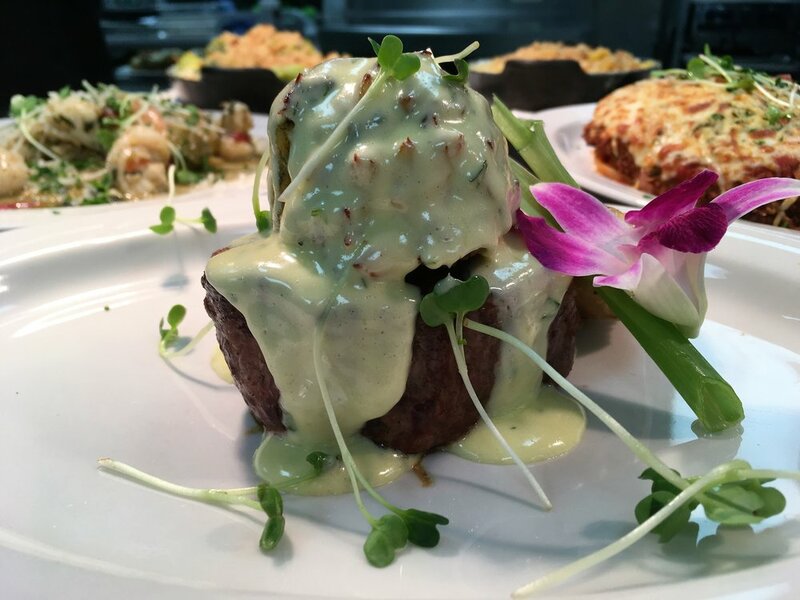 J. Ford's Black Angus prides itself for having an exceptional array or servers and staff--front of house and back in the kitchen. We like to think of ourselves as family, with our patrons being an extension of that family. Here at J. Ford's Black Angus, every employee knows this great restaurant starts with them. This can be seen on the back of the shirts on kitchen staff.